Private cars (including taxis and minicabs) for transporting people make up perhaps only a half of the inappropriately used vehicles clogging our city centres on weekdays. Nor are they the most polluting of these vehicles. Fighting car and taxi dependency and fighting for support for alternative modes of transportation for people will not alone make our cities liveable again. This week, because somebody drove into me last weekend, I have mostly been catching up with the pedestrian and bus passenger’s experience of central London. On Monday morning, already late (I always forget that a half-hour bike commute takes an hour on public transport) and not up to hobbling even the short distance from Cannon Street to Grays Inn Road, I waited outside the station for a number 17. I could see the number 17. It was just down the end of the road at Monument Station. But it took a while for it to arrive on account of the long line of vehicles parked along Cannon Street’s double yellows, beside the “no loading” markings. Vehicles like Thoroughshred‘s DU02OVK. (This van’s hazard lights of course indicated that the vehicle had temporarily broken down, and the driver was visiting a nearby friendly office building who helpfully supplied the box of old documents that fixed the van’s immobility.) Note that Thoroughshred care for the environment by using “low-emission vehicles”. As my bus was finally approaching, Office & General Cleaning had an unfortunate incident on the opposite side of the road: the driver quickly braked and pulled in on the double yellows, firing up his hazards. 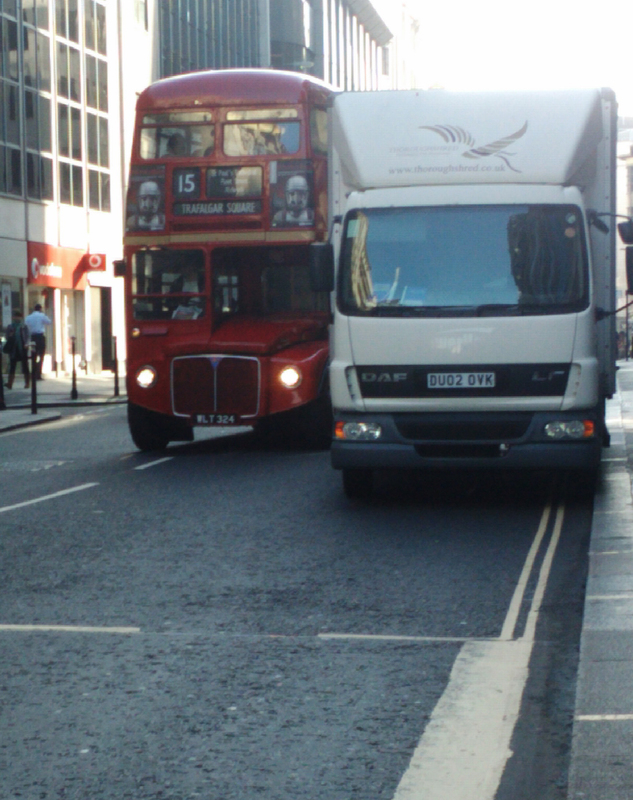 What were the chances, two vans broken down on either side of the road, blocking the busy bus routes of Cannon Street? All counted, there were seven unfortunate van drivers who had broken down on the yellow lines of Cannon Street that morning, and twenty three on the two miles to Grays Inn Road. Here on the recently remodelled Long Acre, with its fabulous dedicated bicycle contraflow, private mail van EU57OKC makes vital deliveries of toner to Rymans. Elsewhere, on New Change, a van sat at the lights full of towels and tablecloths that it had collected from restaurants to be cleaned on an industrial estate on the north circular. On Exhibition Road they delivered paper cups and single-use wooden spatulas to the museum cafés. On Great Queen Street a lorry swapped around the furniture between conferences at a hotel. All over Soho, bars took deliveries of ice cubes. Everywhere people were delivering blank paper and printer cartridges, stepping over the bags of paper recycling strewn across the pavements. Everywhere people were delivering disposable cutlery while the council swept up the disposed of cutlery. And everywhere people were delivering water. Water. A substance that is available on tap in every London building for a negligible cost. Whenever one suggests that the price of the congestion charge should be vastly greater than it is, that there should be stricter limits on the vehicles that are allowed into city centres, or that a significant proportion of zone 1 roads should be closed to vehicles entirely, one is asked what one would do about all the people who simply have no choice but to drive into Central London: the businesses who need things delivering. Vans are essential and the costs they’re already asked to bear are hurting, we’re told. Well if businesses in the centre of the city are choosing to have ice cubes and water driven to them in vans instead of turning on a tap and buying a £200 ice machine, having contract cleaners cart mops around instead of investing in a broom cupboard, and sending their laundry to a barn on the orbital instead of putting it in the washing machine, I say the costs aren’t hurting enough. Or rather, businesses are not paying their bills. Because, as is amply evident on any journey through central London, the main reason such ludicrous operations manage to survive is by breaking the rules and dumping the consequences on the rest of us. Business is one of those fields that I’m really not competent to begin to comment on — and christ can I think of nothing I’d like less than to be so. But I’m happy to speculate wildly anyway — content that on this topic I don’t really care if I’m spouting embarrassingly simplistic crap — about how Britain, and London especially, built itself into its unhappy van dependency. This situation appears to be the outcome of the pursuit of an extreme outsourcing. The vans of companies specialised in simple everyday tasks, like freezing water and washing tablecloths, serve asset light and asset stripped “enterprises” — owners of nothing, investors in little, employers of nobody, constructing products and services entirely out of the leased and the subcontracted. Whether that’s clever responsible responsive flexible capitalism or dangerous short termist profiteering that contributes nothing of any real value to the lives of our cities is too far outside of my field even for my wild speculation. All I know is that it only works by dumping its costs on society in the form of the traffic in our towns: the vans that we are reminded are so essential. This is the view from my office kitchen back when I had that real job (before I gave it all up to do this instead). 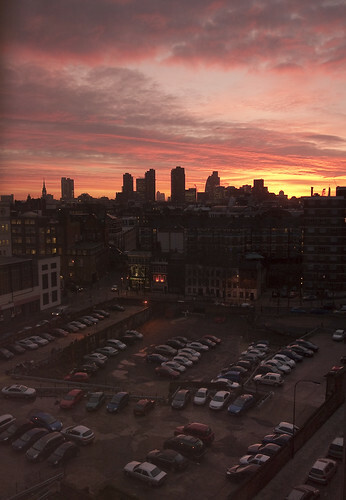 The sun is rising over the city, with the Docklands towers just visible, pale in the distance between the Barbican towers. The street in the foreground is Mount Pleasant. You can just see the Rosebury Avenue viaduct between the houses left of centre. Just poking into shot on the left is Mount Pleasant sorting office, the central hub of the London sorting offices. And all this derelict land in the foreground has been cleared for overflow car-parking for the staff. I’m sure that the employees, even the 9-5 managers, would call to their defence the fact that this place operates 24 hours a day, which the tubular railways do not (shush, don’t mention the fact that buses and bicycles do). But the presence of, and even more so the presentation of, the overflow car parking is significant. Several floors beneath this building is the Mail Rail, an underground narrow gauge electric freight railway built by the Post Office in the mid 1920s to link Whitechapel sorting office in the east to Paddington station in the west via Liverpool Street station and several other central London sorting offices. There were once plans to link even more terminus stations and sorting offices this way. Over the years those plans slipped away, ever more unlikely to be realised, as the Post Office, a nationalised industry unable to persuade politicians the treasury of the merits of such capital expenditure, discovered that it could do things cheaply and easily enough using our heavily subsidised road freight infrastructure. Indeed, trucking stuff around on our streets has been made so absurdly cheap that by 2003 the Post Office was telling us that Mail Rail cost five times what it would cost to truck the mail across town. It can’t have helped that there are a million health and safety rules on that sort of underground machinery, while society seems happy to let drivers kill and be killed in their workplace. And it can’t have helped that the Post Office were, according to the unions, deliberately running down the railway, pushing up its running costs, and taking much of the mail by road anyway so that it could hide many of the costs of the truck depots and fleet from the estimates on the grounds that those would be needed, Mail Rail or not. And so in 2003 it mothballed the Mail Rail and started driving dozens of 60 foot articulated trucks around town. Especially to the main sorting office, Mount Pleasant. Situated at the top of the Farringdon Road, most of them either come via Elephant & Castle and Blackfriars Bridge, or down the Euston and King’s Cross Roads. Why would it close a perfectly good Mail Rail to invest in trucks and depots and drivers, making dubious claims about savings? Because it has a long term business plan that it can’t openly acknowledge. 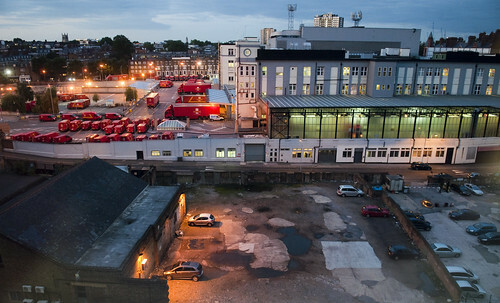 If the Post Office were to remain doing what it has always done, it would make good business sense to maintain the Mail Rail, a fantastic device that allows them to get the mail in to and between its central London sorting offices without having to drive trucks into the central zone. But the Post Office doesn’t expect to be doing what it has always done. It has already lost its state monopoly — albeit in the most bizarre fashion which allows private companies (and subsidiaries of other countries’ state postal services!) to compete for the easy and profitable job of collecting the mail while obliging the Post Office to then do the more labour intensive job of taking it the “final mile” (Mount Pleasant is a much more colourful place since the DHL and UPS and UKMail and, my favourite, Norbert Dentressangle trucks started turning up to dump their letters on the poor posties). And the process of privatisation has slowly eased along over the years, reaching, last month, the passage of the act that allows the government to sell the company, if and when it is ever ready to do so. Once complete, ever more of the Post Office’s business, including delivering to that final mile in places where, as in London, it can be profitable, will go to the cheaper competitors, unencumbered by such expensive frills as unions and customer service. And I’m willing to put money on what happens next, either while the government is rushing to get the business into a state that looks attractive to potential buyers, or immediately after it has been sold off. Mount Pleasant will be closed, sold off, and demolished. The building shows the signs of a bare minimum maintenance regime. Enough to keep it hobbling through. When they needed a bit more space to take the incoming mail, they built a corrugated iron extension in less than a week. Clearly not a structure they expect to last. And that car park. That wasteground overflow car park. Derelict land being kept derelict in central London. That’s an organisation that says: we won’t be long; we’re not putting down roots. There will be an order to preserve the Mail Rail, behind a concrete slab in the basement of whatever “mixed-use development” replaces Mount Pleasant, just in-case circumstances change and a use is found for it in the future. But an accident or act of untraceable night time vandalism during construction will result in the tunnels being flooded and written off. Indeed all central London sorting offices will close, for they all sit on extremely valuable land whose sale will help keep the company’s books looking healthy for a while. The sorting offices will consolidate into just a few. Big metal barns on the ring roads. It’s already happening in Yorkshire. Perhaps there will be one at Staples Corner for the mail from the north. One in North Greenwich for the mail from the continent, coming through on trucks loaded on the Shuttle. Sites convenient for the motorways and the North Circular. Not like Mount Pleasant and the other central sorting offices, hidden away on little city streets. No more will you see the posties on their iconic Pashley cargo bikes. They tried to get rid of them already, but they discovered that there wasn’t enough room at Mount Pleasant and Oxford Street to store that many new vans. The new sorting offices will have room. They’ll have to, if they’re going to do central London rounds that start from the North Circular or beyond. 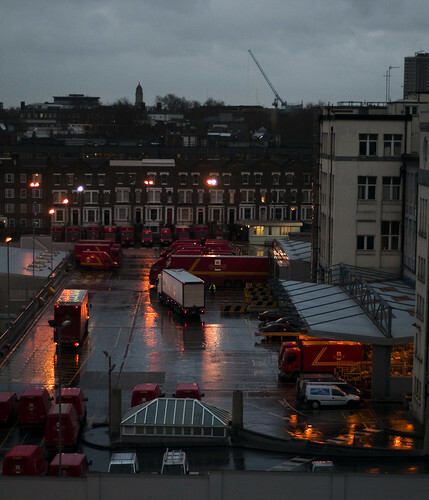 No one at the Post Office will mention the loss of the Pashleys, but they’ll press release the fact that the new sorting offices’ motorway-side locations mean that they will no longer have to drive 60ft articulated trucks through central London streets, and the mayor and the cycle campaigners and the bloggers will celebrate. This is why “smoothing the flow” doesn’t work. Making the roads easier to use and more reliable reduces the cost of road transport and allows businesses ever more opportunities to change their practices and cut their costs by using more road transport. Create capacity and somebody will create a way to fill it. It’s great for business, they say. Why should a shop pay expensive central London rent for a store room when it can drive its stock in from a cheap barn on the north circular? Why should a hotel invest in a washing machine and a maid when it could have its laundry driven to a cheap barn on the north circular? Why should a bar pay up-front for an ice machine when it can have ice driven in from a cheap barn on the north circular? Why should the Post Office maintain central London sorting offices, bicycle deliveries, and an underground freight railway, when its competitors are all operating out of barns on the north circular? Because we pay for it. Road freight isn’t cheap, it simply avoids paying its bills. We pay for the rehabilitation and lost income of the people hit by the vans. We pay for the care of the people dying from air pollution related diseases and sedentary-lifestyle related diseases. 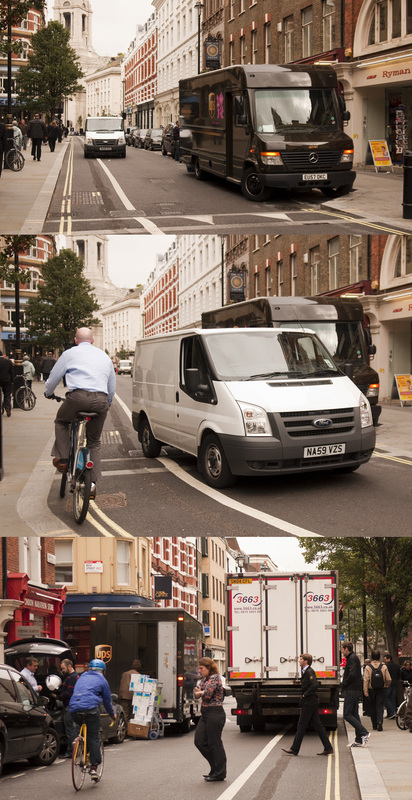 We pay for the trains and taxis and buses because cycling and walking is difficult and unpleasant in a city choked with vans and trucks. We pay for the noise pollution and the water pollution. We — or Camden taxpayers, anyway — pay for the bollards that they’re constantly knocking over outside the Packenham Arms, ’round the back of Mount Pleasant. And we pay because making this kind of business cheap makes other kinds of business difficult. Liveable cities attract businesses and talented employees, retail spend, and tourism. London, we are regularly reminded, is competing with the other great world cities and European capitals to attract the headquarters of big companies and major employers. The Post Office isn’t cutting its costs, it’s externalising them, dumping them on the rest of us, like the competitors who in turn dump the expensive bit of the business of delivering mail on the Post Office. This business plan, of course, depends on road transport remaining cheap and easy for all time. Like the railway closures of fifty years ago, we will look back at this era and marvel at the short-sightedness of it all.